Engaging music has always been a major source of joy for me when feeling up, and of solace when down. This page is devoted to the bands who've meant so much to me both recently and over the years. I was fortunate to grow up in the 1970s when lots of excellent music was around, and discovered a taste for tuneful, energetic but not overly aggressive, tender, intelligent and passionate bands, whose songs connected through to my inner heart and soul and deeply moved me. My main passion has always been for classic rock, as this is the style I find I most easily relate to, but I enjoy any band or artist that I can 'connect' with. Only the most commercially successful bands are well remunerated. Many of the musicians who've given me the most pleasure live lives much harder than my own, and do so willingly because they care deeply about the conditions of peoples' lives and human tragedy, and want to entertain and enhance our culture. Many times more decent and selfless than some I meet in other walks of life. But I believe that if you really like something in this world you should actively support it, rather than taking it for granted until too late. So I get to as many gigs as practicably can and I've created these pages, and run the sites I run, to espouse and help promote my favourites while helping you connect up to any you may find interesting. Karnataka are a wonderful melodic rock band, originally hailing from Swansea but now based in London. Their music incorporates sophisticated musicianship, sensuous playing, intelligent and varied songwriting and passionate feeling. They have now done two tours with their latest lineup including great young vocalist Hayley Griffiths (left). Their early songs embodied a unique South Welsh Celtic spirituality which touches my soul deeply. They have now released a great new album Secrets of Angels. Their brilliant live performances are captured superbly on their live albums New Light and the earlier Strange Behaviour (original lineup). 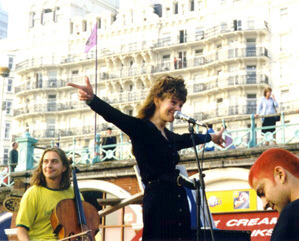 They won a brace of CRS awards, including Best Band 2003, Best Album 2003 for the magnificent Delicate Flame of Desire, and lead singer Rachel Jones (right) was Best Female Vocalist for four years running. Their second CD The Storm was my favourite of 2001, including The Journey which is one of the most joyful and uplifting pieces I have ever heard. I have photographed them at Monmouth Festival on 30/7/02, Derby Flowerpot on 20/3/03, Derby Flowerpot on 8/11/03, Rotherham on 15/5/04, Vibes from the Vines on 12/8/06, Leicester Y on 30/3/07, Bilston Robin 2 on 14/10/08, Bilston Robin 2 on 19/2/12, Bilston Robin 2 on 8/3/15, Leicester Y on 17/4/15, Bilston Robin 2 on 11/10/15, and Bilston Robin 2 on 5/2/17. 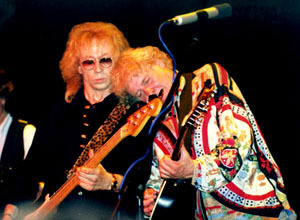 I've been a very big fan of the Strawbs (John Ford and Dave Cousins, left; Dave Lambert, right) ever since I discovered them in the mid 70s. I have always found a resonance with their spiritually-inclined prog-folk-rock material, full of feeling. I have taken photos at gigs including Exeter Phoenix gig on 20/4/01, Bilston Robin 2 on 28/6/05 (electric band), Derby Flowerpot on 8/2/02 (original Acoustic Strawbs lineup), at the NPL in Teddington on 2/12/06 (Hero and Heroine electric lineup), at a private party at Wythall on 16/9/06 (new Acoustic line-up with Chas Cronk), at their Xmas party in Teddington on 2/12/06 (several line-ups plus guests), Twickenham Stadium at their 40 Years On festival on 12/9/09, and Bilston Robin 2 on 27/4/16 and 22/3/17. I am a co-moderator of the Strawbs chat list Witchwood. Panic Room are a fine Welsh band, originally formed from the core of Karnataka's original lineup, with Anne-Marie Helder (left - vocals, guitars, flute), Jonathan Edwards (keyboards), Dave Foster (guitar), Yatim Halimi (bass) and Gavin Griffiths (drums). They produced a great new album Skin, following their earlier albums Satellite and Visionary Position, and have now released a further album Incarnate. 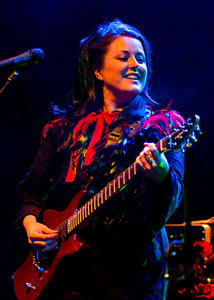 Anne-Marie was awarded Best Female Vocalist 2011 by Classic Rock Presents Prog magazine, and CRS Personality of the year by the Classic Rock Society in 2010 and 2011. She is also a member of Mostly Autumn. 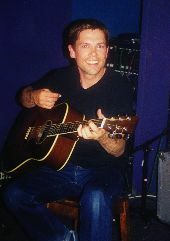 Gavin Griffiths was awarded Best Drummer of 2010 by the CRS, and is now the regular drummer for Fish and Mostly Autumn. I photographed their live debut at Lydney Town Hall on 11/4/08 and their gigs at Leicester Y Theatre on 17/11/12 and at Bilston Robin 2 on 12/7/13, 1/12/13, and 17/5/15. Mostly Autumn are another great melodic rock band with Celtic influences. Hailing from the York, their songs combine passion with fantastic musicianship and I steadily became more and more addicted to their spirited music. They are masters of live performances, usually very tight with great poise and sound balance - generally you can easily hear what all the instruments are playing despite being a seven-piece band. 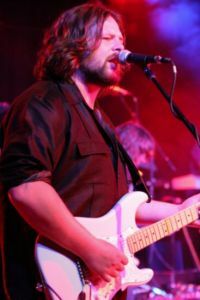 Guitarist and main-man Bryan Josh (left) has won the Classic Rock Society's Guitarist of the Year award on more than one occasion, and former vocalist Heather Findlay won Female Vocalist of the Year in 1999. Since then, Olivia Sparnenn (right) has taken over the lead vocals, and Chris Johnson has joined in place of Liam Davison. I have taken photos of Mostly Autumn headlining Rotherham Rocks in 2005, at Bilston Robin 2 on 8/12/13, and Bilston again on 7/6/15. Irony are a rock/folk/jazz/blues/soul fusion band from the Thames Valley. I discovered them back in '97 after hearing their fabulous song Maria Bahran on a sampler CD distributed with now-defunct Rock magazine Frontiers (we miss ya guys!). Sung with extreme passion and containing an awesome guitar solo, it was exactly the kind of track to blow me away. Mainman Dany moved to the south of France in 2006, though the band still performed in England from time to time when he came back to visit, and also played the occasional gig across the Channel. But he returned in 2014 so they have been able to rebuild their momentum since then. After running their official website for several years, I still keep it up as a fan site, though I was grateful when the opportunity arose in 2010 to hand over the official site responsibilities to a new webmaster. 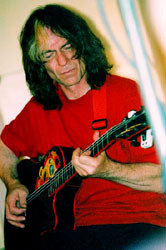 Irony have now produced six great CDs and Dany produced some good solo CDs during his time in France, with many tracks featuring other Irony members. 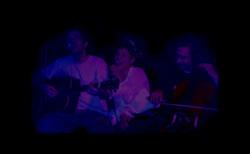 Legend are a great folky Pagan progressive band who play with a rare passion and feeling. I enjoy all of their CDs as well as seeing their superb live performances, my favourite being Triple Aspect. Legend have now reformed and issued produced new CDs Ritual Echo, Cardinal Points, containing the superb track Spark to a Flame, and Spirit. Nigel Shaw and Carolyn Hillyer are two pagans from Dartmoor who play with conviction in a great variety of styles. They are also the core of tribal dance band Global, whom I liked instantly when I heard them supporting Gong at a one-day festival in Bath in 1996. 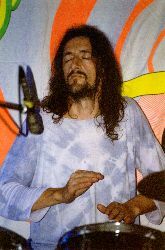 They also played a great set, as a duo, at Malvern in May 2002 - on that occasion their music carried a wonderful vibe of peace and tranquility, which can also be found on Nigel's CD Requiem - Well of Souls: we chose the track Rest Gentle Heart from this album as one of the musical pieces for my father's funeral. Carolyn has just released a lovely new CD The Wyched Wombe. Spiralize were a Malvern-based tribal dance band who played gigs locally. Sadly they have now parted their ways, as the nights I spent at their gigs were some of the best of my life. They played a unique kind of tribal sound which combined Lizzie's exquisitely sensuous vocals with powereful but flowing rhythms and good melody lines. Their gigs were also adorned, wherever possible, with the vividly colourful flourescent drapes you can see in some of the photos. The whole atmosphere was just right. As their photographer I took several sets of photos and I hope these will now stand in tribute to a fabulous band I sadly miss. There is now a MySpace Spiralize profile. 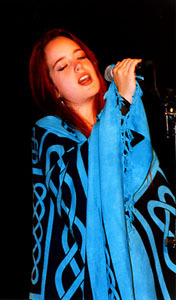 The Reasoning were a progressive band led by ex-Magenta bassist Matt Cohen and including former Karnataka lead singer and four-times CRS Best Female Vocalist Rachel Jones. With a talented lineup including three good vocalists their numbers include good vocal interplays. They have now recorded three great CDs Awakening, featuring a guest appearance by Steve Rothery of Marillion, Dark Angel and Adverse Camber, the latter featuring their latest lineup with Tony Turrell at the keyboards and Jake Bradford-Sharp on drums. I had a great time listening and taking photos at The Peel Live Music Venue in Kingston on 14/4/07, and Bilston Robin 2 on 20/1/08, Bilston Robin 2 again on 19/10/08, and Leicester Y on 14/11/10. Another long-time favourite is Peter Hammill who of course led and inspired 70s band Van der Graaf Generator. Their songs combine great musical inventiveness with intelligent, forthright lyrics, and are passionately delivered. My favourite VdGG epic is Childhood's End from the album Still Life - the lyrics are a philosophical tour de force in which he dismisses conventional attitudes to life to leave a persuasive view of his place in the grand scheme of things. After Crying are a brilliant Hungarian band who play a symphonic, spiritual style of progressive rock. Their album De Profundis is a real favourite. PTS were a superb Dutch progressive band whose album Campaign was far and away the most outstanding new CD I heard in 1997. Its raw unbridled passion hits me with enthralling sensuality and sensitivity. Its textures are replete with subtle touches which easily withstand the loud playing that best suits its direct, bombastic style. Illusion were formed in 1976 and included Jane Relf, Jim McCarty, Louis Cennamo and John Hawken from the original lineup of Renaissance (who had all left before Annie Haslam joined). Both of these incarnations played a strain of bright folk/prog rock with a rare freshness. Inkubus Sukkubus are a passionately energetic pagan gothic band whose gigs are always brilliant fun and a great excuse to shake the body around. They've also written some class songs, especially on their Belladonna and Aconite CD. Curved Air made some fabulous records in the 70s, they had a tremendous line-up and played with skill and passion. I saw a couple of good gigs including Cardiff Castle in 1976, but sadly only at the end of their existence. They also have a chat group at groups.yahoo.com/group/curved-air - click here and just send a blank email to subscribe. Porcupine Tree are a magnificent English prog/psych/trance band led by Steven Wilson, who is also the creative force behind No-Man and the Incredible Expanding Mindfuck, and also played on and produced Fish's Sunsets On Empire. 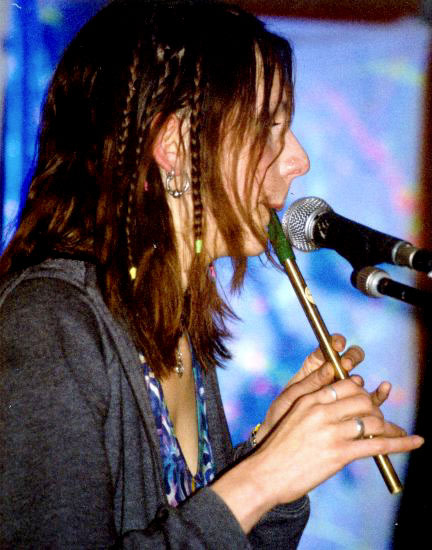 Dagmar 41 is a talented German musician and former English student. We made contact when we found we were both big fans of Peter Hammill and Chris Judge Smith's opera version of The Fall of the House of Usher. Dagmar wrote her dissertation on comparing this with the original Edgar Allan Poe story, and has now published this as a book The House is I She then produced a privately recorded CD called Ferric (my own personal favourite, warm and sensuous in spades) and has since released several others. All her works show remarkable insight and freshness, and Ferric is my favourite CD of 1998. Headhunters were another great Malvern band doing high-quality dance crossover music. Their debut album Millennium Time Bomb features a list of guest artists headed by Nigel Kennedy. Official website here! Barclay James Harvest - 60s/70s English progressive band with a heartfelt warm pastoral sound. I am particularly fond of their earlier songs - Mockingbird, Galadriel and Child of the Universe among others. Blue Aeroplanes - alternative English band from Bristol. Breathing Space are a superb band formed by former Mostly Autumn keyboard player Iain Jennings. I have photographed them at Bilston Robin 2 on 20/1/08. The Butterflies of Love - alternative US indie band. Camel - classic prog-rock from the 70s till today. Dead Like Harry are a great young band from Sheffield. I was very impressed with, and took photos of, their appearance at Rotherham Rocks 2005. I also photographed them at Brighton Komedia on 22/6/06 when they supported the Strawbs. Earthstone - a Norfolk pagan group whose CD Seed I come back to time and time again. King Missile were an American alternative band with a difference! Mastermind - slightly heavier progressive band from the USA. Mermaid Kiss are a new band of stylish musicians from Kington (Herefs). Their debut CD The Mermaid Kiss Album is a delight, and their second CD Etarlis is brilliant. Their style is hard to describe, but their songs are soulful, rather than rocky, and remind me a bit of The Paradise Motel. I have photographed them at Malvern on 24/4/04 and Lydney on 11/4/08. John Miles is an old fave, I especially liked his Rebel and Zaragon albums, and Music is masterful. I remember seeing him play this live at the Cambridge Corn Exchange one year and turning a previously angry crowd (after equipment failures) into a standing ovation. Joan Osborne - brilliant rootsy female vocalist also from the New York area. Quarkspace - contemporary psych/trance band from Ohio. Rachels - neo-classical group, originally from Baltimore in the USA. They gave a good performance in Glasgow back when I was there. RiverSea - new British band led my Marc Atkinson of Gabriel. I photographed their debut gig at Bilston on 19/10/08. were formed partially of musicians from Earthstone. 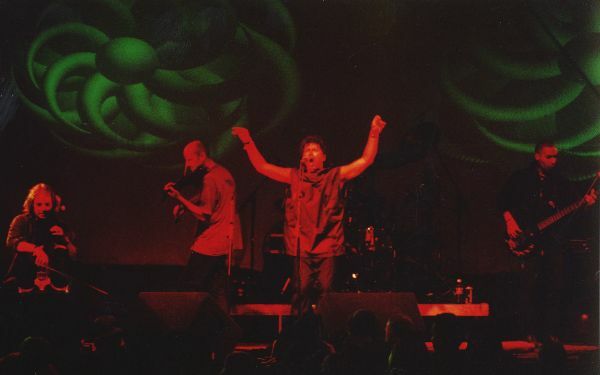 Strangefish were voted Best New Band of 2003 by the UK Classic Rock Society, an award well merited by the quality and variety of their debut album Full Scale. Oliver Wakeman - son of Rick and a fine composer and performer of pagan-influenced numbers, he has also produced a superb CD-EP The View from Here with Rachel (Heffer) of Common Ground. 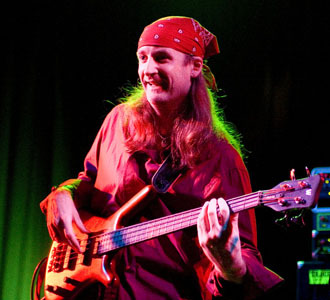 John Young is a great singer/keyboard player/songwriter who writes heartfelt songs and has played with Asia, John Wetton, Steeleye Span and Bonnie Tyler, among others. The Tea Monkeys (Leicester) - original songs with a good fusion of styles and some fun lyrics. My favourites are Six-Pint Personality and Sunday Afternoon Revisited. I have now included some photos from their 2nd Anniversary gig at Leicester Shed on 15/7/06. 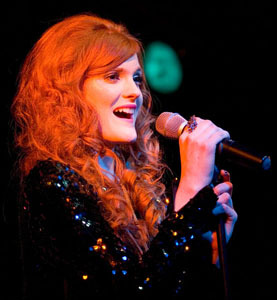 Coriander Helen (Leicester) is a talented singer/songwriter. I am particularly addicted to her Karmic Waters! Flatworld (Malvern) are a lively folk band who play songs that combine French and East European styles. The Celluloid Band (Malvern) continue to push musical boundaries with their own unique sound. ist (Leicester) are another inventive band from this vibrant city. You will also find more good bands among my friends on MySpace. 'Cause in this world of troubles, my music pulls me through!